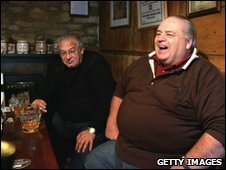 BBC News - Cider drinking: What's the a-peel? Cider drinking: What's the a-peel? The government has whacked a big increase on cider duty, but what is it about the apple-based beverage that excites such strong passions from drinkers? Cider is going to cost more. Duty rates will increase by 10% above inflation and it's going to have fans spluttering into their scrumpy. Recent years have been good to cider drinkers and the industry that goes with it. The marketing drive carried out by Irish brand Magners in the mid-2000s changed everything. Marketing people called it the "cider-over-ice" effect, and the adverts conjured up images of hazy summer days spent with photogenic friends in Grade I-listed country pubs. Sales rocketed, doubling across the UK between 2004 and 2008, according to the Welsh Perry and Cider Society. But cider has a dark side, craft producer Roy Bailey of Lambourn Valley notes. "There are a lot of 'industrial' high strength ciders not greatly connected to apples," he says. "These are the ones people get from supermarkets and get drunk in parks." Such brews are a fixture on park benches in many areas of the country as well as providing a rite of passage for underage drinkers. So it's perhaps not surprising that a disproportionate tax on cider might seem like a good idea to those in power. Indeed cider with a strength over 7.5% will have its duty increased by even more than the 10% above inflation on ordinary strength cider. "From 1 September 2010, the technical definition of cider will be changed to ensure products that more closely resemble made-wines [the strongest varieties] are taxed appropriately," the Budget Report says. "The industry has a very clear choice - it can either see this extra duty imposed or it can choose to reduce the alcoholic strength of its ciders," a Treasury Official told Reuters. As a producer of fewer than 70 hectolitres of cider a year, Roy Bailey is in any case small enough to be exempt from duty under special rules. But he is still worried on the impact on other bigger craft producers. "Most producers of craft cider are very civilised. People don't drink craft cider to get smashed," says Mr Bailey. "Cider has greatly improved - it isn't just a rough farm drink. These people make quality products. Cider like this is really as good as wine. It's not a pub drink. More a drink to savour with a meal." Yet for some cider struggles to shake off its stigma as a gateway drink to the grown-up world of alcohol. Sweet and fizzy, some varieties at least are as close in taste to a can of pop as they are to a delicately-brewed ale. But that's a generalisation that takes no account of the wide range of ciders on the market, says Jan Gale, of cider pub the Coronation Tap in Bristol. "It's quite sophisticated. It's not all rough, scrumpy cider for country folk," she says, batting away suggestions it's merely a drink for childish palates. "It's sweet, dry, cloudy, carbonated, all sorts. It's a personal choice." Fellow enthusiast, Richard Knibbs, rhapsodises about the simple pleasures of a pint. "A really dry cider sets your tongue on fire. It's a different experience than beer," says Mr Knibbs, owner of Ye Olde Cider Bar in Newton Abbot, Devon, since 1973. "With bottled single-variety apple ciders, you get lovely, lovely flavour. Beers don't have the same lingering taste of a really nice cider". Despite its explicit dedication to preserving traditional beer, the Campaign for Real Ale (Camra) also has a watching brief over the fortunes of cider. It is understandably irked by the Treasury's sudden interest in the brew and is demanding government action to support and protect "small real cider producers". "Hitting small real cider producers with this hike will cause irreparable damage to one of the nation's most historic craft industries," says Camra's chief executive Mike Benner. "The government must introduce a relief package to support the UK's small cider producers." The British Beer and Pub Association has also indicated its annoyance at all of the rises on duty. 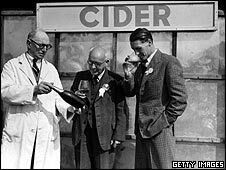 But perhaps the most alarming opposition came in the form of a statement released to news agencies by West Country folk group The Wurzels, known for their hit, I Am A Cider Drinker. It read: "We are all very upset that scrumpy cider, being one of the few pleasures that we cherish down here on the farm in the West Country, is being hit by such a tax rise." And while the groups music may struggle for mainstream appeal these days - they haven't troubled the top 40 in more than 30 years - their cider sentiments will doubtless have more popular appeal. This new legislation is poorly focused. Yes, the industrial, chemically produced ciders which have very little to do with actual apples and known to many as "tramp juice" are a contributing factor to the social blight caused by street- and under-age drinking, but they have absolutely no connection with the quality products made by artisan cider makers in the West Country. To properly address the problems this legislation was supposedly framed to correct, the extra duty might more sensibly have been imposed on carbonated cider, i.e. the stuff peddled by supermarkets and convenience stores, while leaving alone natural cloudy cider as purveyed by pubs, cider houses, farmer's markets and the like. Children and street drinkers tend not to frequent such places. As a person with Coeliac Disease I cannot drink beers or ales (unless I go to one of a few special pubs that get gluten free beers in). My alternative choices are wines, spirits and ciders, and whilst I do like wine and the odd spot of rum, gin or vodka, sometimes you want a drink that's going to last longer and not get you absolutely sozzled (or leave you stoney broke); cider becomes your ONLY choice. As far as I'm concerned I see this as Coeliac-Tax. Unfortunately I as a small registered cidermaker find myself between a rock and a hard place. The unregistered cidermakers making a yearly maximum of 7000 litres do so tax-free, while us producing 90,000 litres have to collect taxes. The big industrial cidermakers making millions of litres really control the industry and liase with the treasury regarding taxes etc., and they do not want smaller producers like myself to have a get-out clause of a sliding scale of tax like micro-breweries have for beer. I seriously wonder if it's worth carrying on. A good cider can be almost as delicious as champagne. It doesn't have to be sweet, stick, or fizzy! Ah, cider! I remember my grandad regularly going along to the local undertaker/ handyman/ beekeeper/ cidermaker in our village with a plastic one gallon container to purchase his favourite tipple of home-made scrumpy. It was cloudy, the colour of strong wee and two pints could knock a man flat. There were rumours that a calf's head was added to the fermenting liquid to add "bite"... I once plucked up courage to ask the cidermaker about this and received nothing but an enigmatic smile in return. I don't drink often, but when I do I like a good interesting pedigree beer or cider. I go for taste and quality. To have 10% duty on cider because of teenagers and chavs abusing alcohol through drinking screen wash which is loosely related to cider cos it might have a drop of apple essence innit is discrimination and against my human rights and everything else that's unfair in the world. I do not agree with the tax rise on all ciders. I use it both in cooking, especially with pork, and also as an after-meal drink. I find it very refreshing. I can understand strong white cider being taxed more because of the high alcohol content, but not the traditional cider. Proper cider is neither "sweet, sticky or fizzy". Comparing a drink made by fermentation from apples in Somerset to the stuff drunk by tramps made by adding alcohol to apple juice concentrate is like comparing a fine Cognac to meths. Proper cider has a very strong quite bitter taste. I take this a personal attack on my West Country heritage! The good name of cider has already been eroded by the fizzy rubbish they serve over ice that probably hasn't even seen an apple in its production process. Save our scrumpy! Few people realise, but Herefordshire suffers disproportionately from these extra duties. Not only does Herefordshire produce over half of the English Hops used for beer production (more than Kent in fact), but it is also the leading producer of apples for cider production, producing well in excess of 500,000,000 - or five hundred million - litres of cider per year. As has happened since 1997, one of the main farming industries of Herefordshire is about to wither and its struggles will fall on deaf ears.